With my best adventure kecks freshly pressed and (almost) ready for action far, far, away, I wanted to see if my battered old ‘scope was still up to digi-scoping duties, given the lens is covered in more scratches than a Chris De Burgh record once any intelligent person has had their hands on it for any length of time. 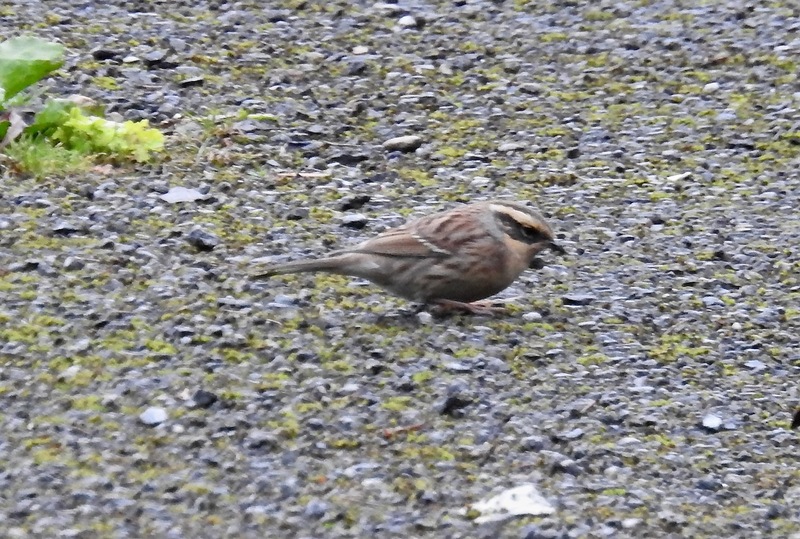 I nipped up at lunchtime today and the bunting was feeding on the foreshore below the seawall up at the Fairway end of Marine Drive. 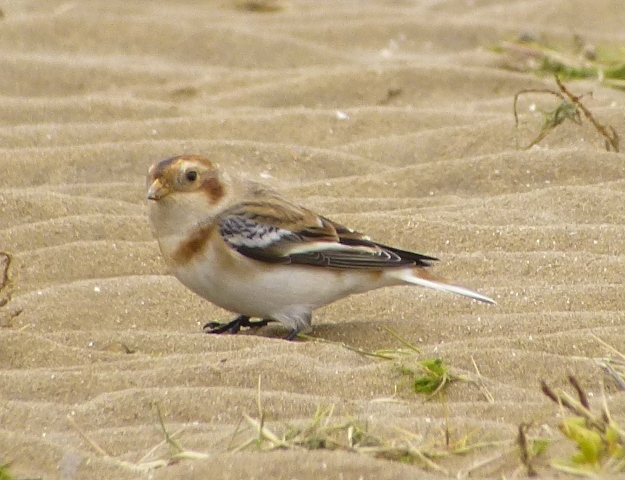 It was frequently hassled by Pied Wags, so flew about a bit, but I just sat and waited for the bird to trundle back up the beach towards me, which it did after a few minutes. 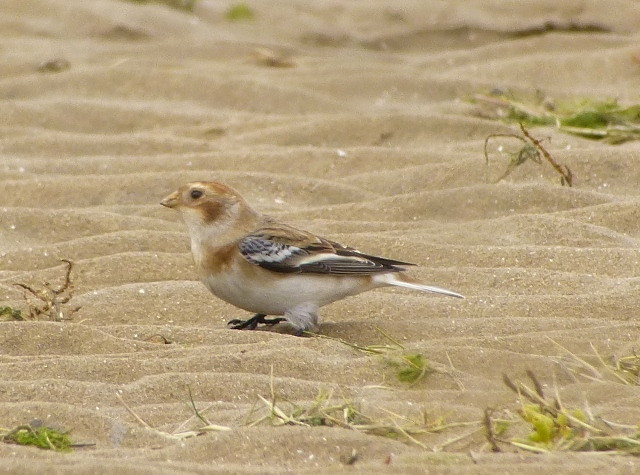 What’s not to like about Snow Bunts? Trilling call, classy “arctic” vibe and fine feathery baggy troosers too. The bird seemed happy in its own universe most of the time, but froze whenever it heard the small finch flock twittering overhead, as if it equated the calls with a threat. Generally ignored me though, which seems to be the norm these days. 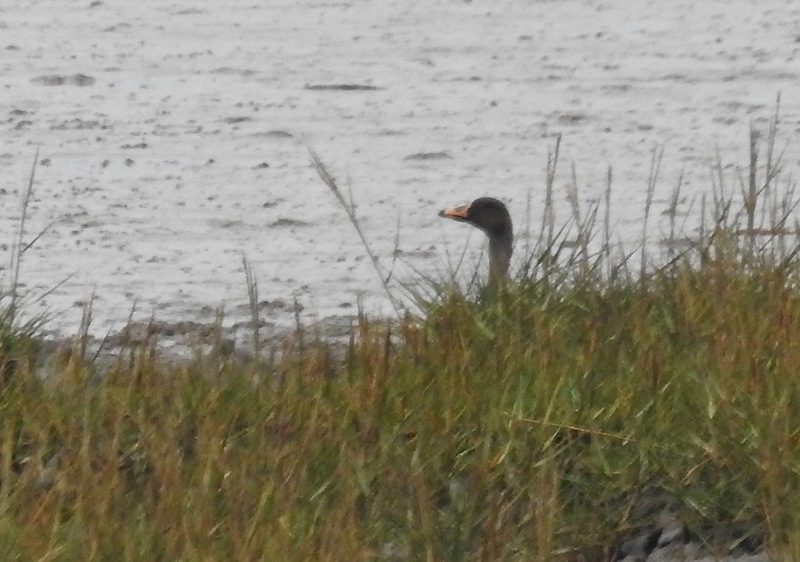 I left it happily munching seeds around the clumps of old salicornia (get me, okay, marsh samphire) and saltmarsh grass. 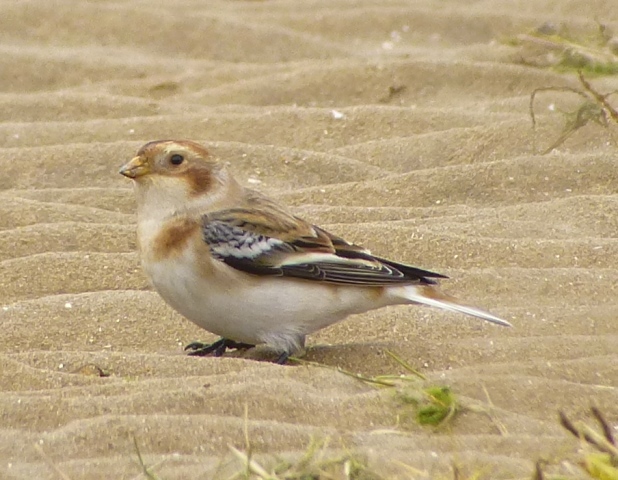 A few Twite with Linnets on the beach here too, but only four or five that I saw, while two Goldcrest were moving through the marram at the back of the Marine Drive car park before I pulled out – autumn passage is still seriously on the go then. In Southport briefly at lunchtime today and I noticed a flock of finches bouncing over the seawall and dropping in by the West Lancs Yacht Club. 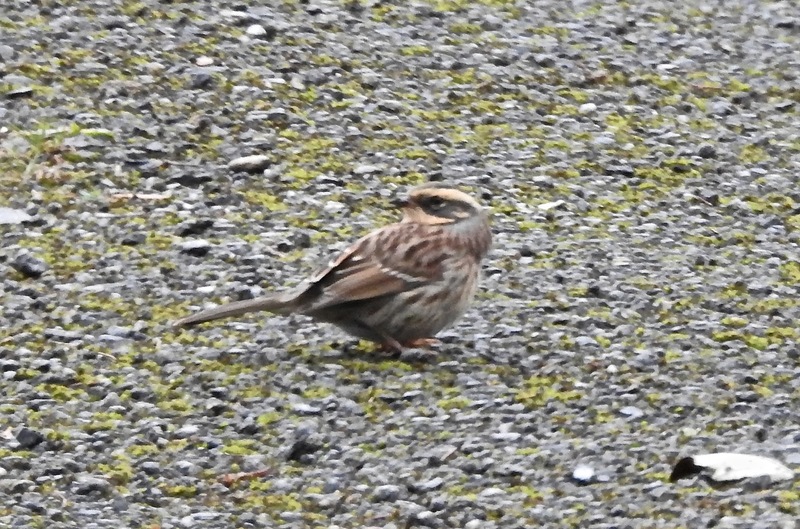 A quick look revealed a flock of about 40 birds, mostly Twite, with a few Linnets thrown in. Flighty as hell, they appeared to be returning to the roof of the yacht club, presumably there’s a handy puddle of water up there for thirsty Twite. 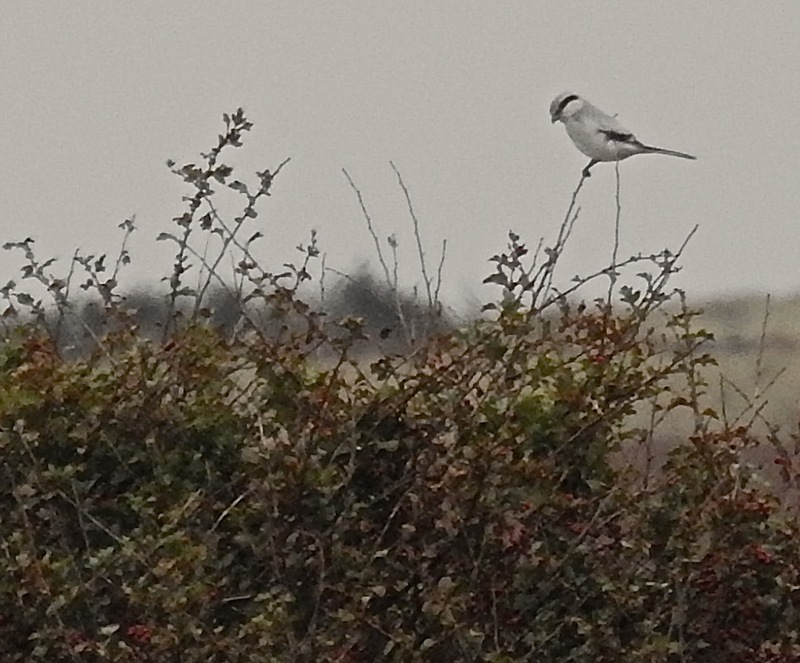 A few perched up on the old fenceline behind the sluice for a moment or two, then they were away again off beyond the seawall. Unless you count the constant drone of the Coast Road of course, which seems to annoy me more every time I call in at Marshside. Don’t know why it’s starting to bother me so much really, it has always been like this…. 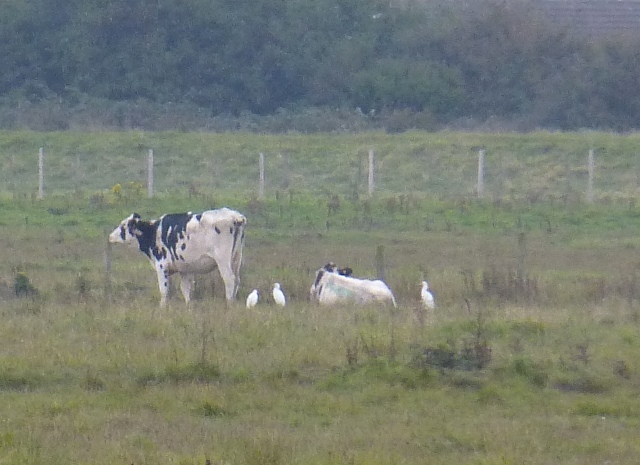 One of the Cattle Egrets was noodling around at the back of the Sandplant lagoon, but I couldn’t see the other two – probably down a ditch somewhere or hiding behind a cow. 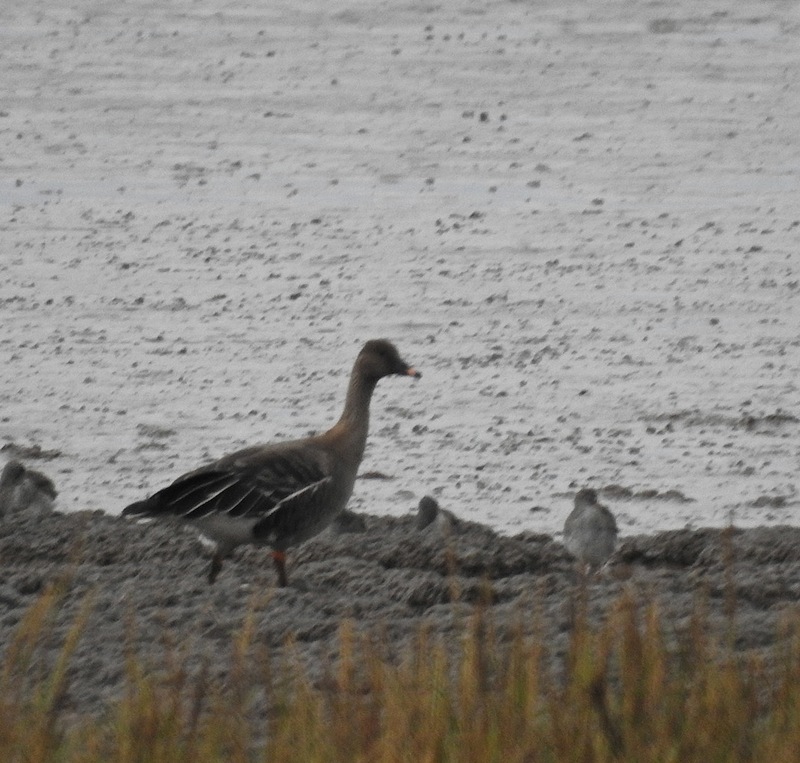 Plenty of Pinkies commuting onto the outer marsh, and up at Crossens a substantial herd of Wigeon, but despite prolonged scoping I couldn’t pick out the Yankee. 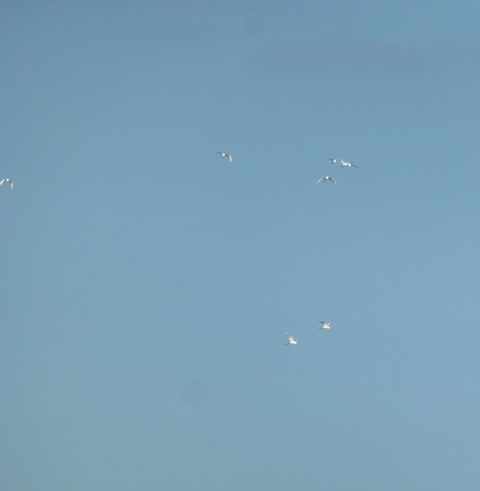 About 15 Ruff up there too, five or six Dunlin, Blackwits, Golden Plover, Snipe and Lapwing. 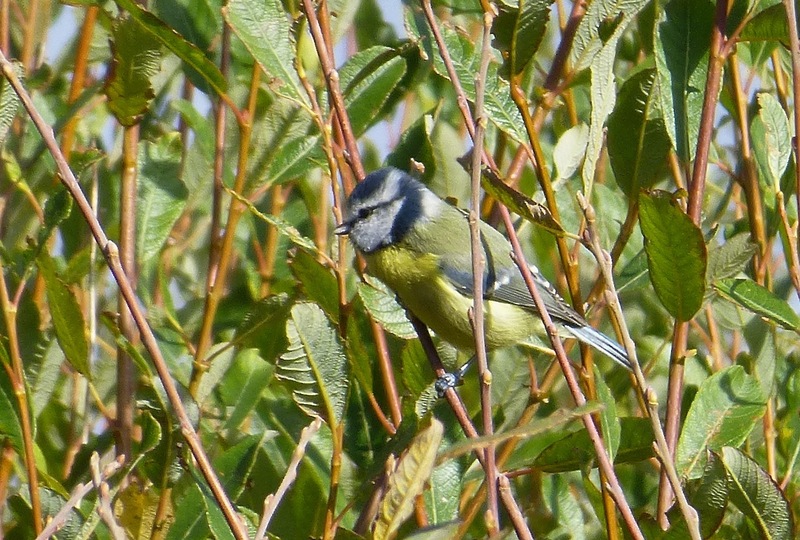 One or two ‘crests and Robins were in the roadside willows opposite the sewage treatment plant. 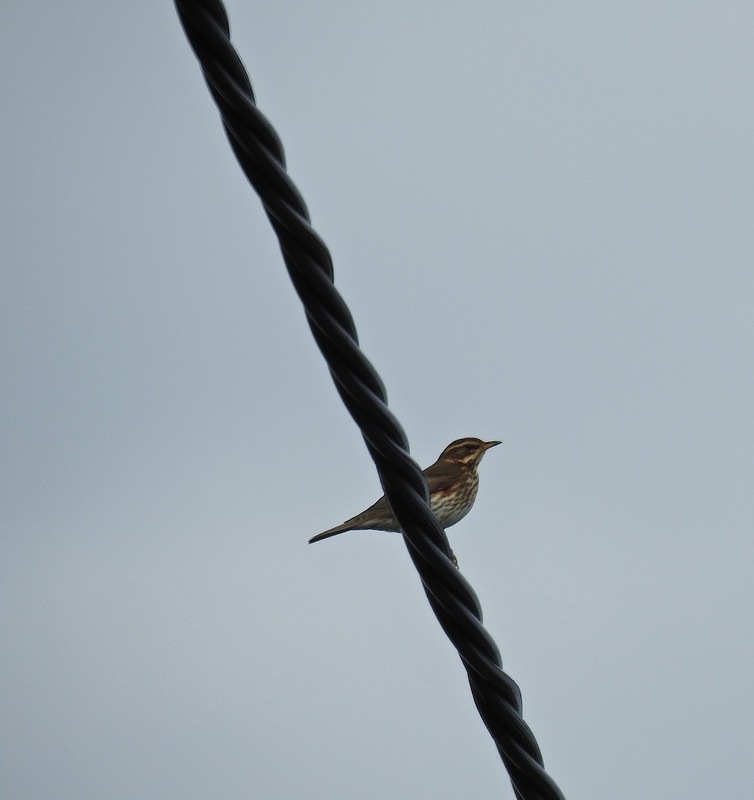 What sounded like Rock Pipits were calling over the outer marsh, but I couldn’t really hear them clearly over the traffic….time to buy an ear trumpet I expect. Managed a quick look over the rising tide at Ainsdale today an hour or two before the rain swept in, the north westerly hooley went absolutely batshit crazy and it became impossible to scan the waves. Common Scoters were flying around all over the place – no white wing flashes today though – and those that were on the water seemed to be having a thoroughly miserable time of it in the deepening swell. More Red Breasted Mergs about than when I last looked too, which is only to be expected at this time of year, and a light southerly passage of Gannets out on the horizon. The troughs probably hid quite a lot out there today…and yes, if the hooley holds up, it is strong enough to push a Leach’s or two in. 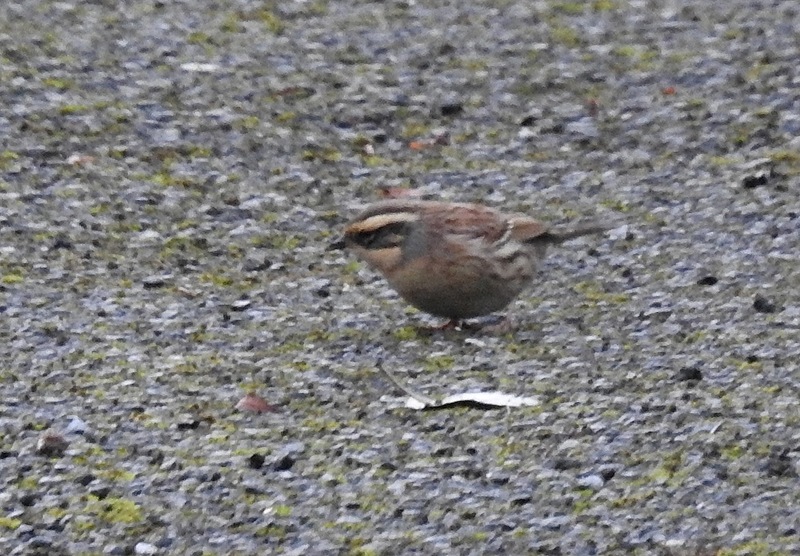 Siberian Accentor, Easington: God’s Holy Trousers. 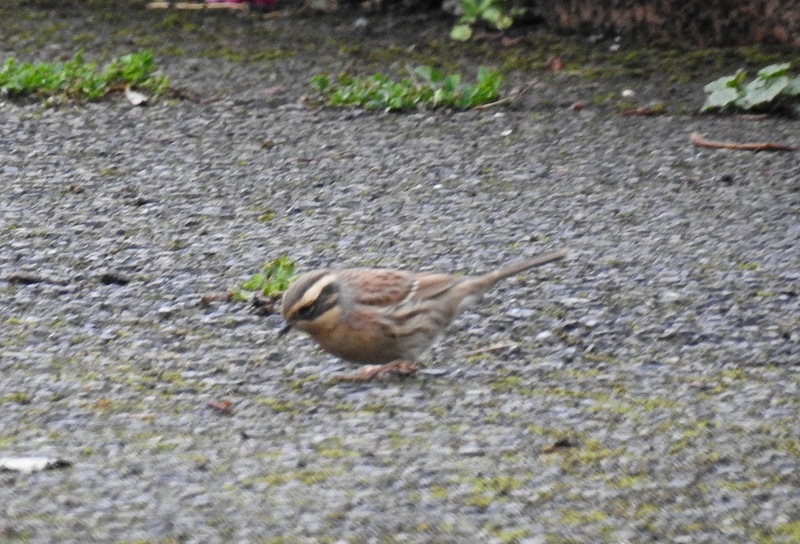 It’s hard to over-exaggerate just how totally splendiferous it was to watch a Siberian Accentor shuffling around with Dunnocks in the half-light of a grey, dreary Easington early morning today – not as bright as the Shetland individual perhaps, but every bit as mind-blowing. Slick marshalling by the team from Spurn Bird Observatory meant that despite Easington being busier than rush hour on the M62, Alan Wright and I managed to arrive at about 7.30am, allowing me to park in the outer suburbs of Hull, walk into the village, join the well-ordered queueing system, and watch the bird (MEGA MEGA MEGA) by 0830am. We enjoyed it so much that we went to the back of the 300-strong queue and waited to watch it again in the grainy morning light. 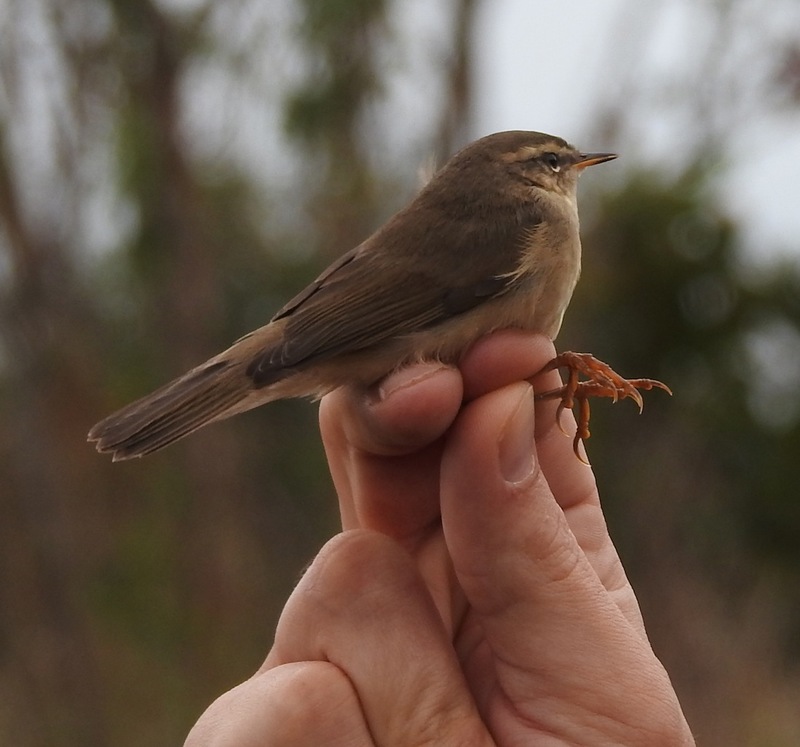 Many thanks to everyone at Spurn Bird Observatory for their efforts – it was a superb job. 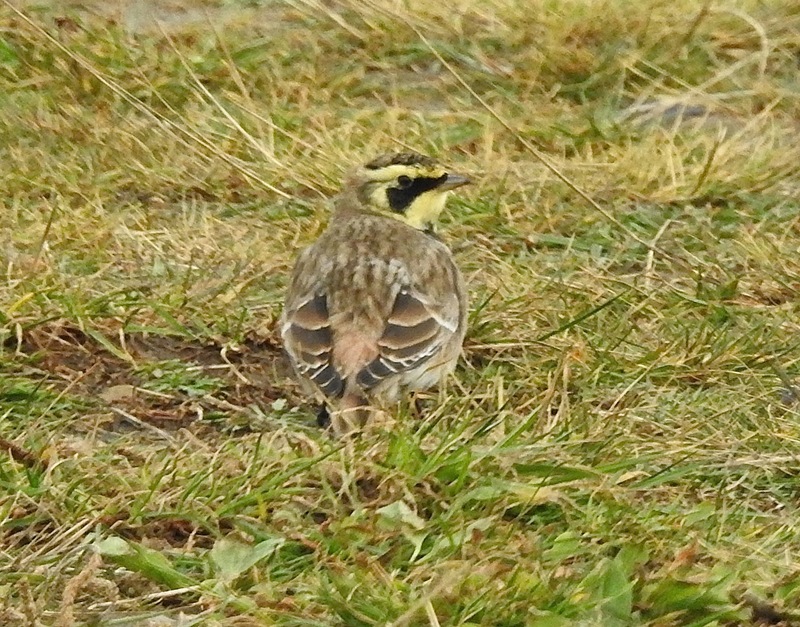 With the biggy safely trousered, I drove onto Spurn and Kilnsea, where scores of Redwings were zipping through, Fieldfares chack chack chacked away, Goldcrests and Robins flitted everywhere and a conveniently tame Shorelark took the edge off the cold easterly by the Bluebell car park. 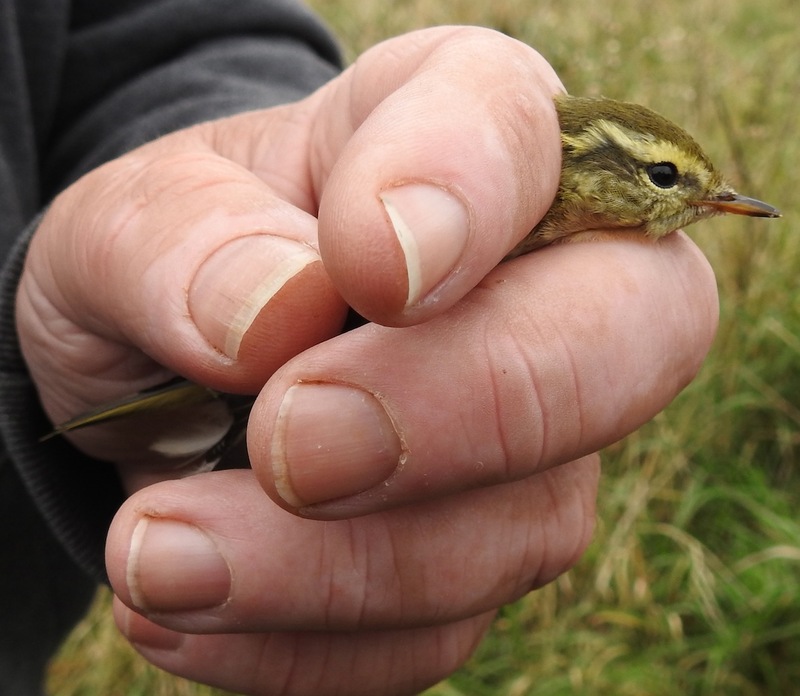 Mealy Redpolls, Bramblings, Blackcaps, Chiffchaffs, Redwings, Fieldfares and Robins, Robins, Robins were in the hedgreows between there and Kilnsea and a quick call to Church Field produced Yellow-browed Warbler and a fine Dusky Warbler on parade courtesy of the ringing team. 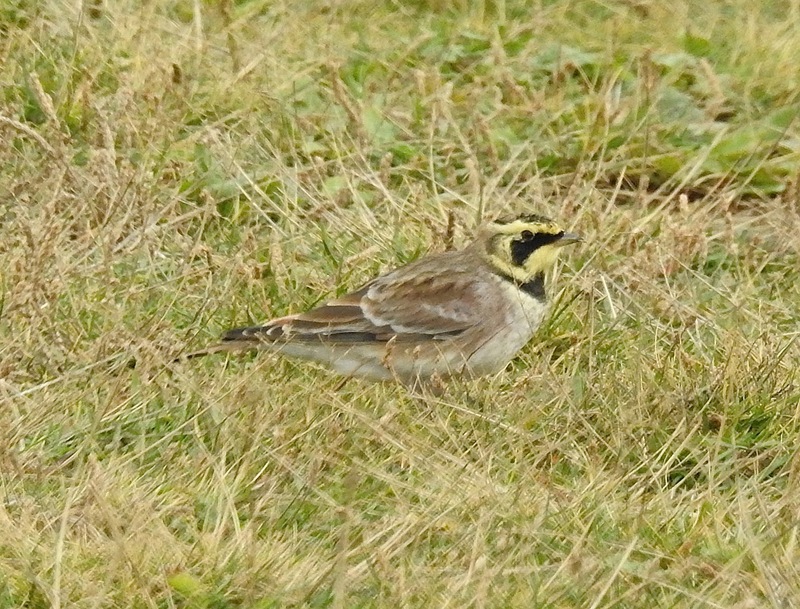 There were hundreds of birders on the ground (I heard an estimated 2,000 people filed past the accentor today), so it wasn’t surprising that more and more birds were turning up – Firecrests and more Yellow-broweds around Cliff Farm’s marvellous garden, a nice flock of about 20 European Whitefronts flying down the Humber estuary, Brents, Ring Ouzels on Beacon Lane and Redstarts in the rocks along the Humber shore. 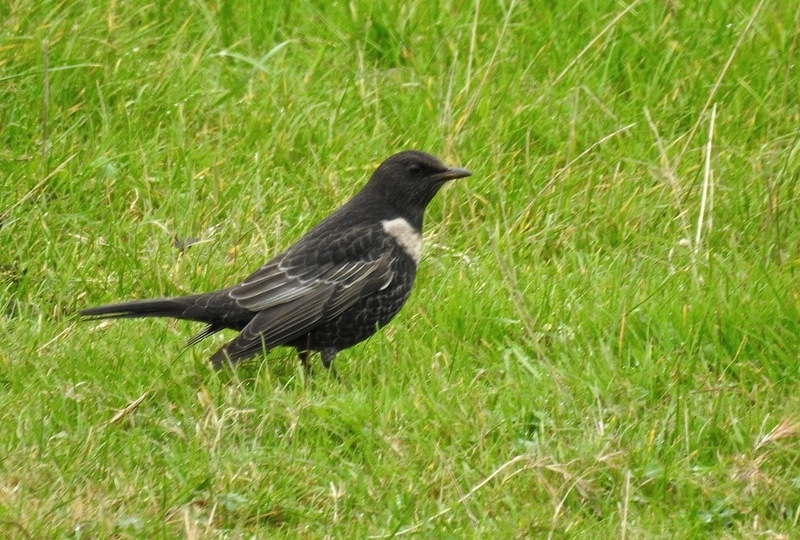 A diversion to Sammy’s Point at lunchtime brought us many more Ring Ouzels (at least 8 birds in the scrub there), with Chiffchaff, Goldcrests and Robins everywhere. A Pied Flycatcher joined them just below the car park. After that I drove back onto the peninsula for a look at a flock of nine Bean Geese playing hide and seek in the marsh edge north of The Warren – eight Tundra and one Taiga apparently…one certainly had a great big bright yellow conk and was swishing its backside about like Mae West in her Sunday best bustle, so it may well have been a fabulous fabalis…(upper pic below). 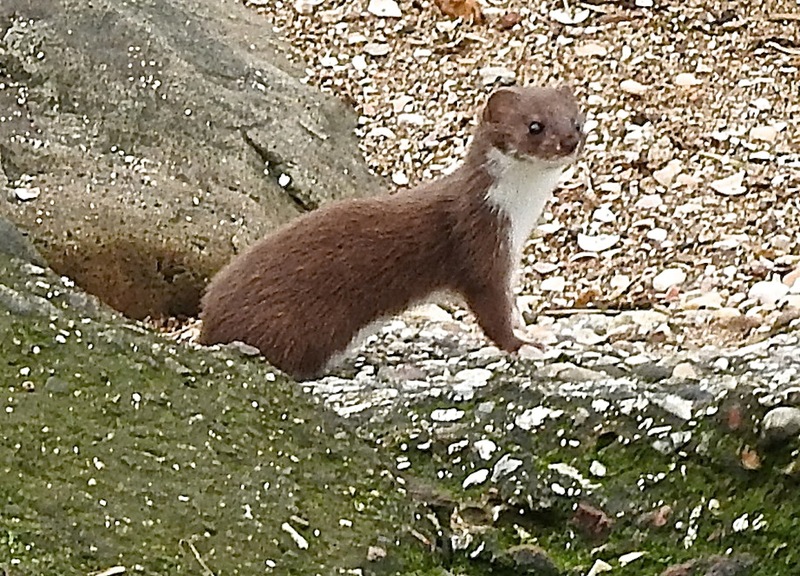 Perhaps one of the best things about Spurn today was the fact that almost EVERYONE was there…I got to say hello to folk I ain’t bumped into for years. Thanks everyone, great to see you all again (you know who you are, you were there). 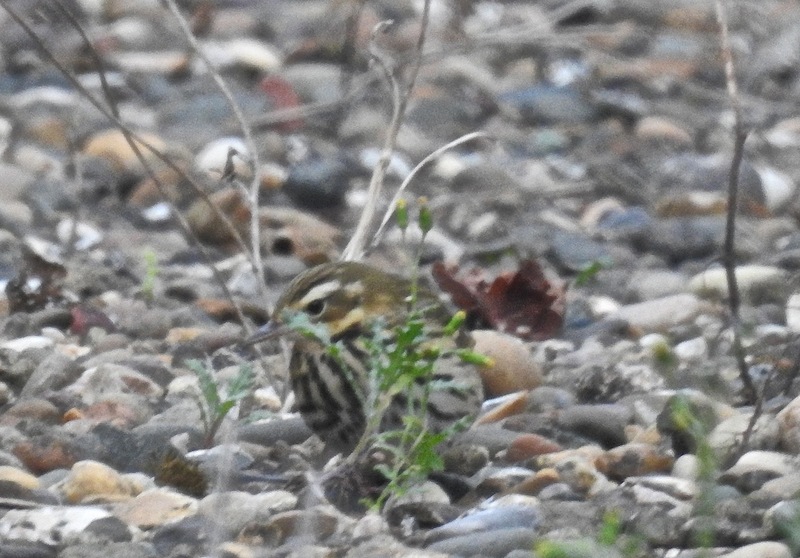 With Redwing overload reaching critical mass there was just time to pop into the Crown and Anchor car park late afternoon to finally catch up with the hyperactive Pallas’s Warbler we’d been managing to miss all day – a vision in green and yellow scooting through the branches like a demented stripey hummingbird. 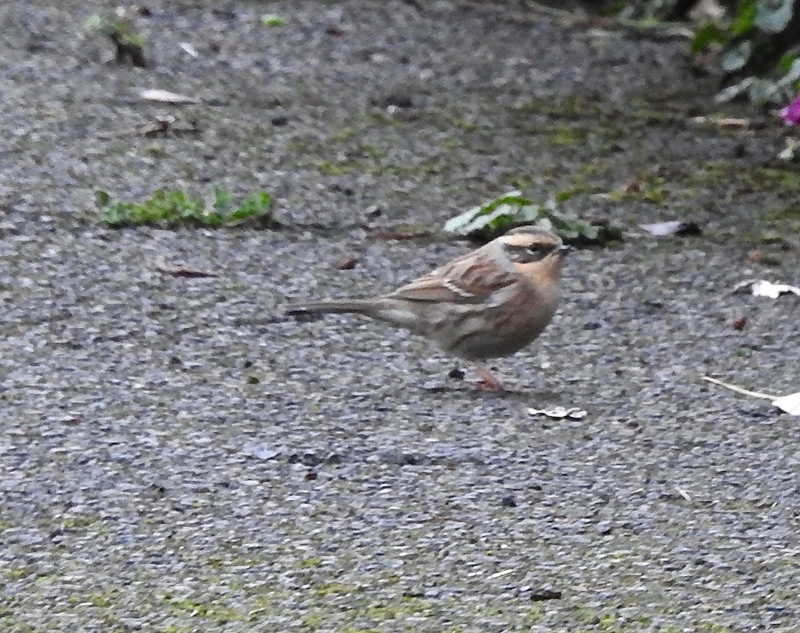 Wouldn’t be surprised if more Sibe Accentors are on the menu (Scandi-Germany is infested with ’em), or at least something of an equally earth-shattering stature. I didn’t get out yesterday – I went furniture shopping with the boss, lured in by the promise of sausages, or the potential of sausages, to tour tired “antique” outlets for the perfect thingumyjig across Lancs backways that were bathed in gorgeous autumn sunlight. There were a few problems with this – firstly shopping in general blows big time, and secondly scouring a 1960s/70s piece of cheap crap with sandpaper to give it a distressed look does not constitute the creation of an “antique”. While thirdly, and perhaps, most importantly, THERE WERE NO SAUSAGES. 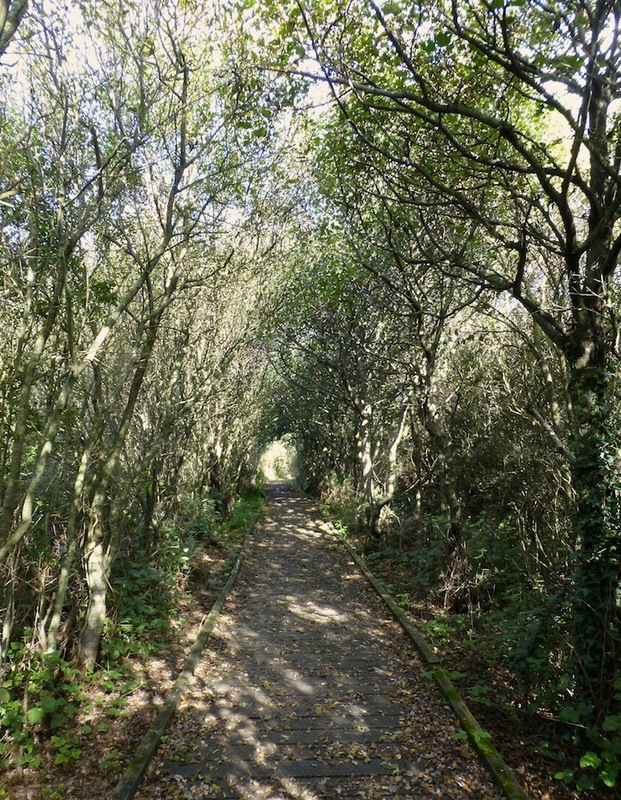 So, as the country slowly sinks under the weight of megas, rares and class autumn migrants, the best thing to do today was take a stroll round Sands Lake at Ainsdale – that always puts things in perspective. 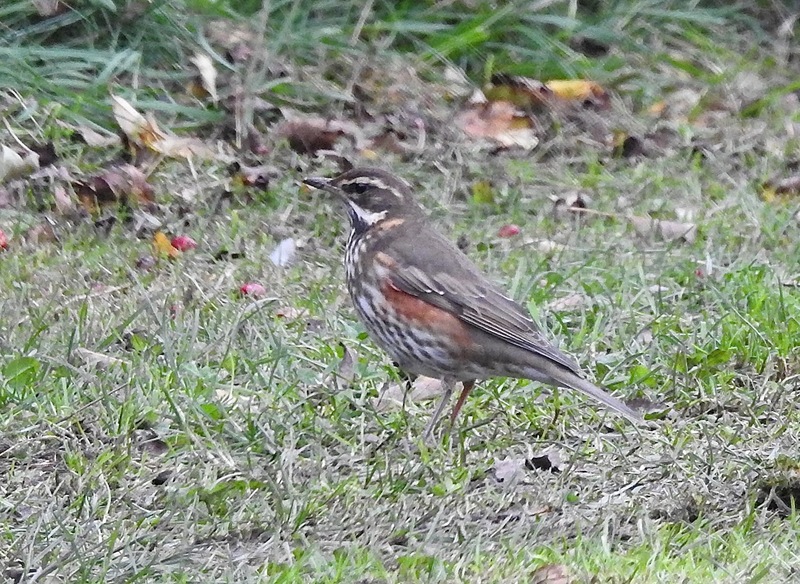 Redwings and Skylarks passed the tower during the course of the morning, with the winter Reed Bunting flock at Ainsdale already swollen to 30+ birds, and flat calm conditions offshore showed off the scoter horde very nicely (but as ever they were out of range). This was enough to encourage me out of doors at lunchtime. Sands Lake always feels like it should be good – look how rare it appears in the pic above – can’t you just imagine an Ovenbird popping out of that…???? 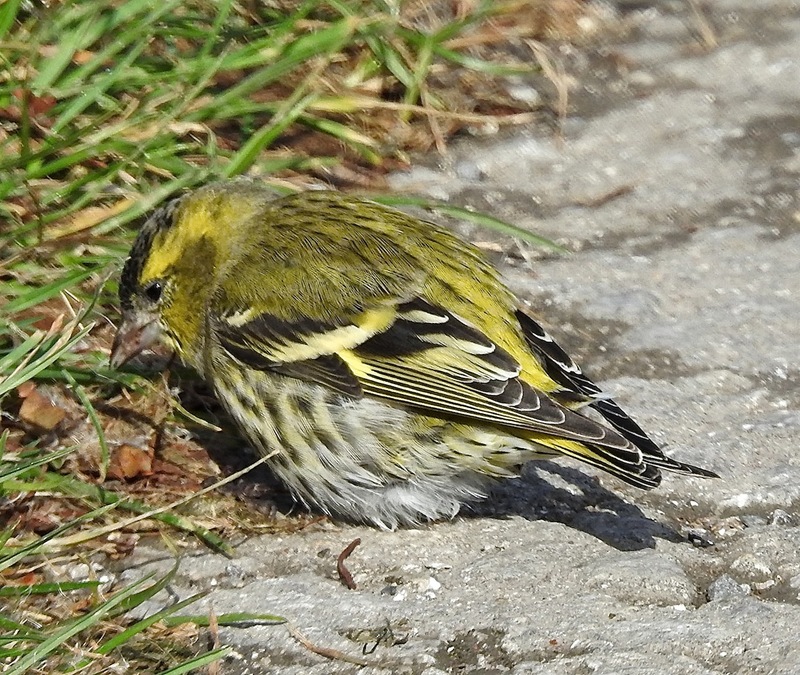 But the best I could drag out of it today were five Goldcrests, a single Chiffchaff, two Siskins over, 11 Goldfinches and one of the local Common Buzzards getting battered by three Carrion Crows. Four Shovelers were spinning around each other on the water and Gadwall were amongst the Tufties and Mallards. Autumnal perfect at Spurn this morning as Neill (Hunt), Alan (Wright), Pete (Allen) and I arrived at 0815, with large numbers of migrants flitting about, but I suspect there was only one bird that was really playing on our minds. 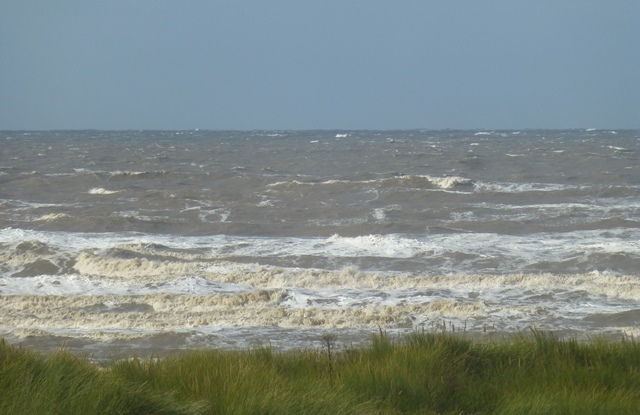 Despite the hundreds of Robins, Goldcrests and Redwings, I know I was still thinking about the whereabouts of this week’s crippling Black Browed Albatross – after all, the North Sea was right on the doorstep…and you can’t ignore the water at Spurn. 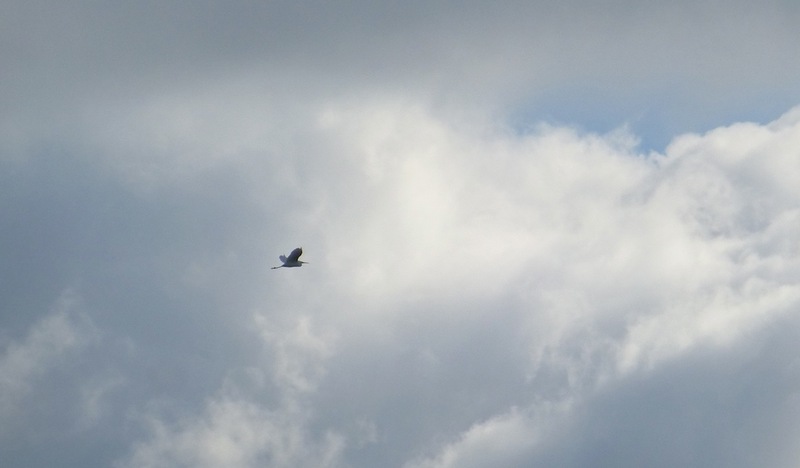 Sightings of the big boy just after 2pm off Hunstanton down in Norfolk got our hopes up, but despite a mid-afternoon seawatch, we knew it was a long shot and we soon returned to enjoying the fall, almost putting the big bird out of our minds for another day. 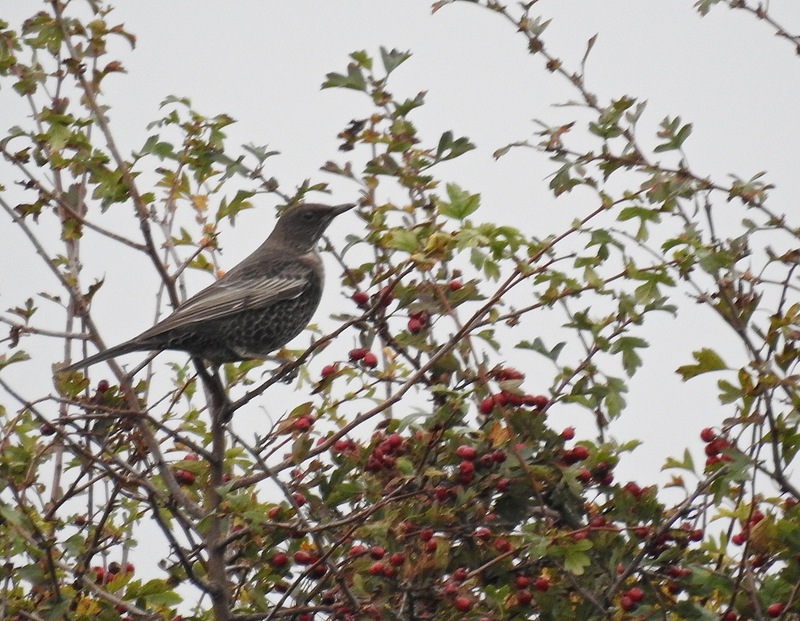 Luckily there was lots else to occupy us – Ring Ouzel and a fine Great Grey Shrike at Sammy’s Point, with stacks of Goldcrest, Chiffchaff, Blackcap and Redwings galore – marvellous. 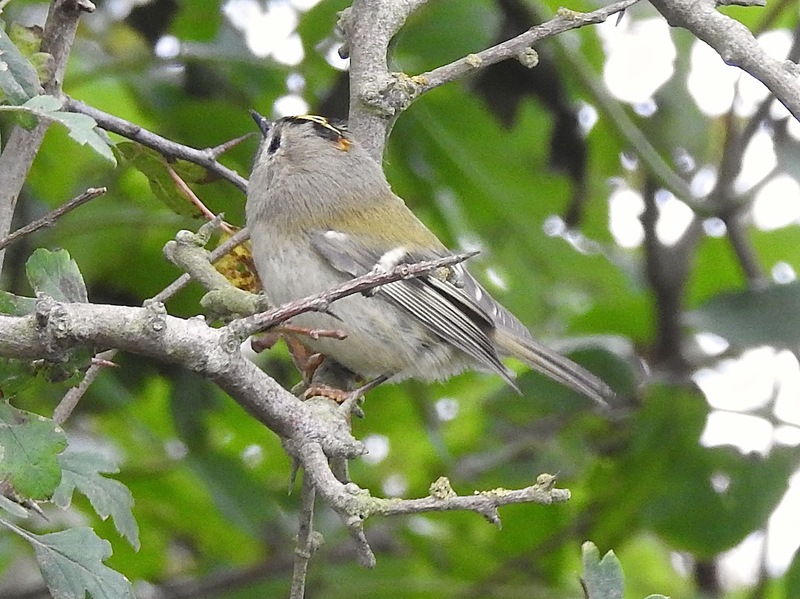 Hordes of Goldcrests, feeding inches away in the branches and through the grass ignored us as they tried to replenish lost energy, but looking at a few of them with really grey heads which contrasted with their green backs, I was reminded of a fascinating paper by Martin Garner and Stephen Menzie on Birding Frontiers about ’em a year or two back. I wonder is the difference between these two I photographed today just about stance, angle and light, or something more? Just like Martin to keep me thinking after his passing… thanks Mr Garner. 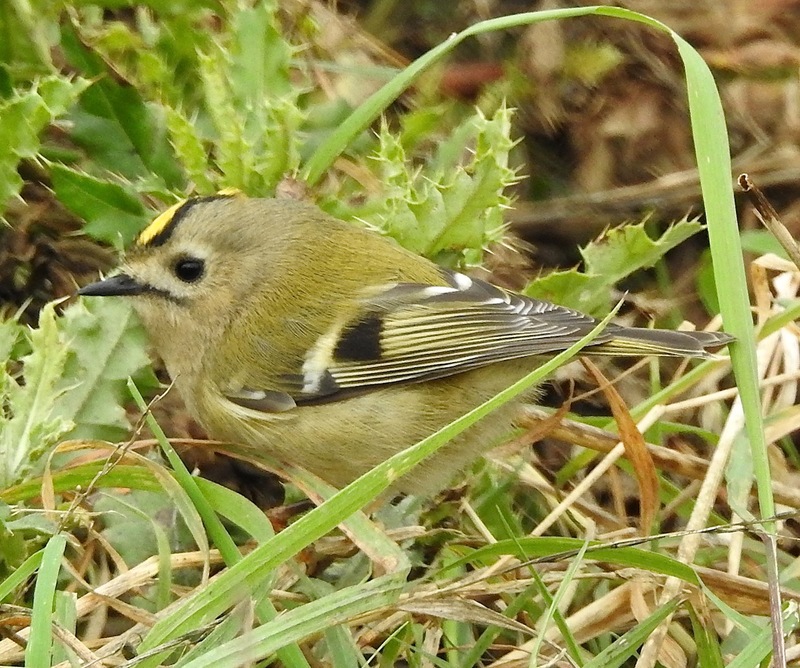 Plenty of other migrants for us to enjoy too today – Chiffchaffs, Blackcaps and hundreds of Redwings with at least 300 Robins. 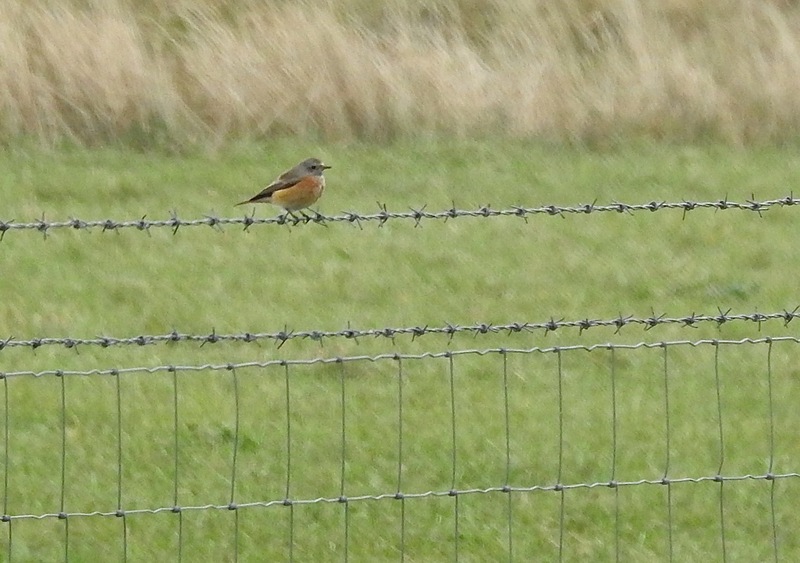 Redstarts and an exhausted Siskin, a hungry looking Weasel and a stray Barnacle Goose joined up with Whinchats, Mipits, Skylarks and steadily increasing numbers of Bramblings as we wandered around Kilnsea and down to Canal Scrape. 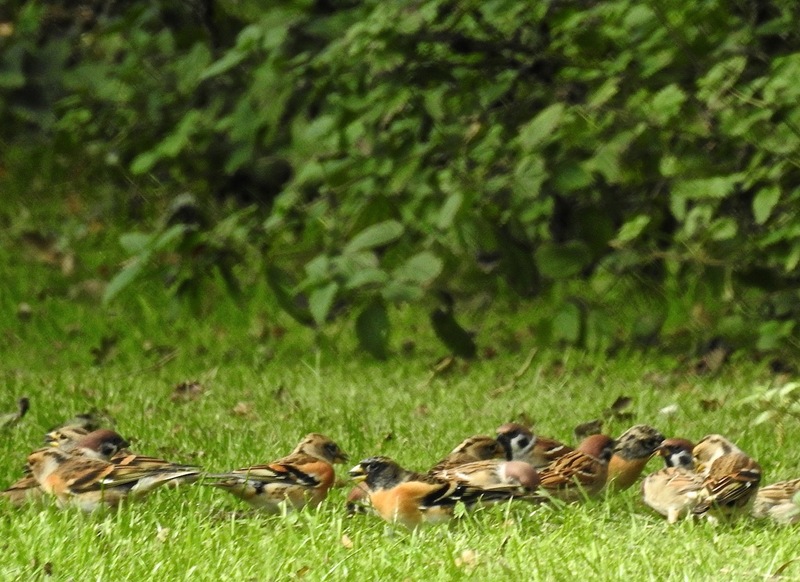 Some of the Bramblings were showing really well down Beacon Lane, alongside Tree Sparrows and more and more Goldcrests, Migrant Hawkers and Red Admirals. Brent Geese yapped overhead as we turned back towards Spurn itself and in the easterly wind after a night of rain and cloud, we felt optimistic. 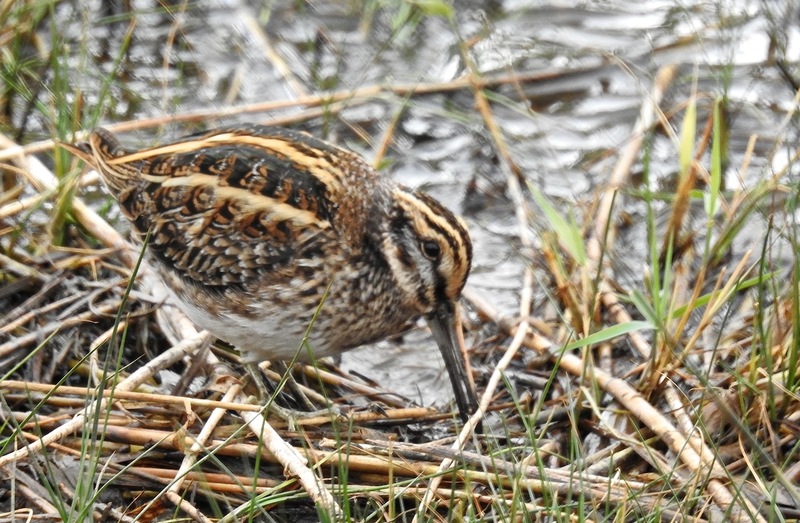 Whinchats, Redstart and Mipits perched on the fenceline as we walked to the Canal Scrape, while more Goldcrests and Robins popped up, and at the scrape three Jack Snipe were bobbing away right under the hide, as a Lesser Whitethroat zipped amongst the Redwings in the scrub. 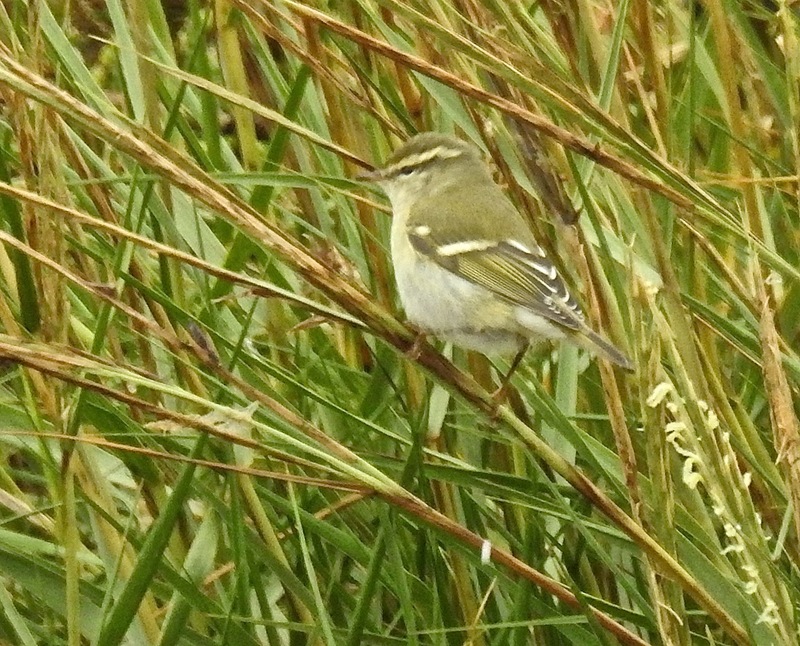 Walking back to Kilnsea along the bank, Water Rails were squealing and a Yellow Browed Warbler (one of six today), fed in the saltmarsh beneath us. 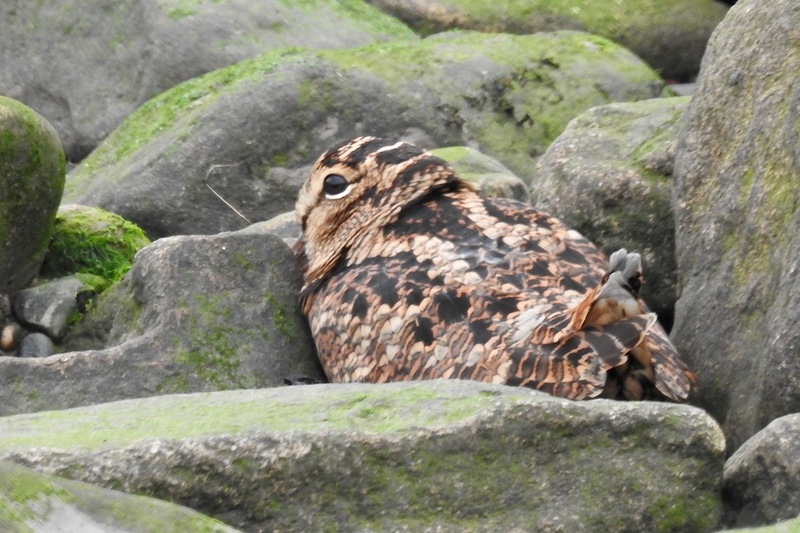 A confused looking Woodcock was sheltering in the rocks below Cliff Farm. 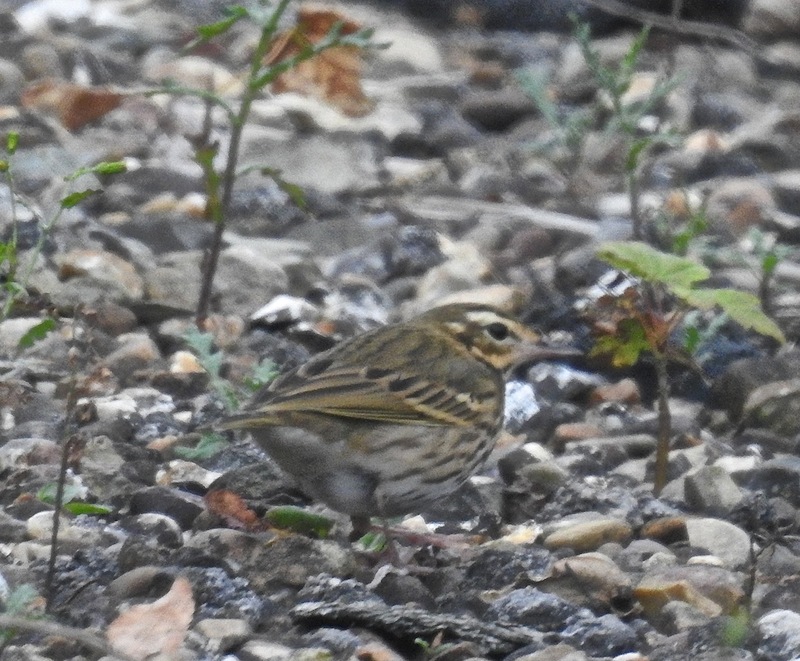 We spent a bit of time in the Church Field with more point blank Goldcrests, Chiffies and our fourth or fifth Rouzel of the day, but we never got near the Rustic Bunting here, or for that matter, the Little Bunting down at Sammy’s Point. 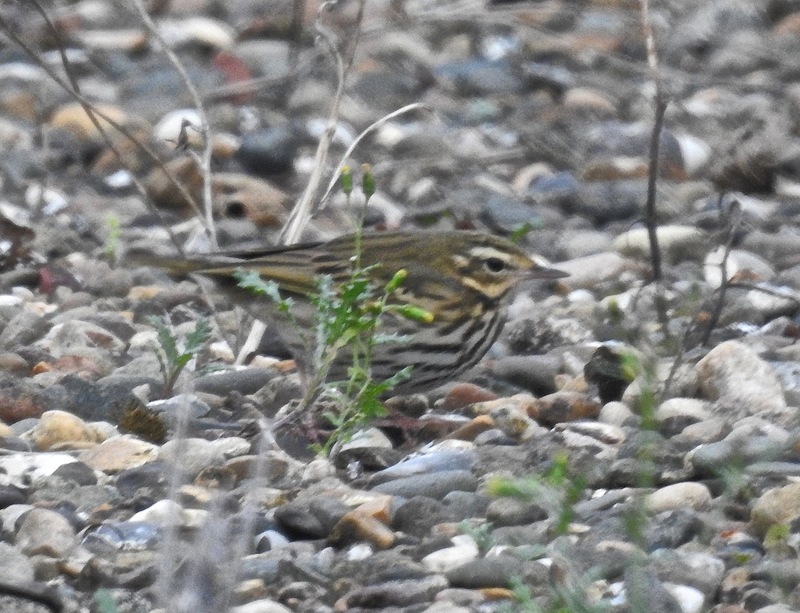 The hours were passing and at 4.30pm we pulled out and headed back up to Easington, where, as we waited for an unco-operative Red Breasted Fly, Andy Roadhouse suggested we should check out the Olive Backed Pipit viewable through the security fence at Easington Gas Terminal. 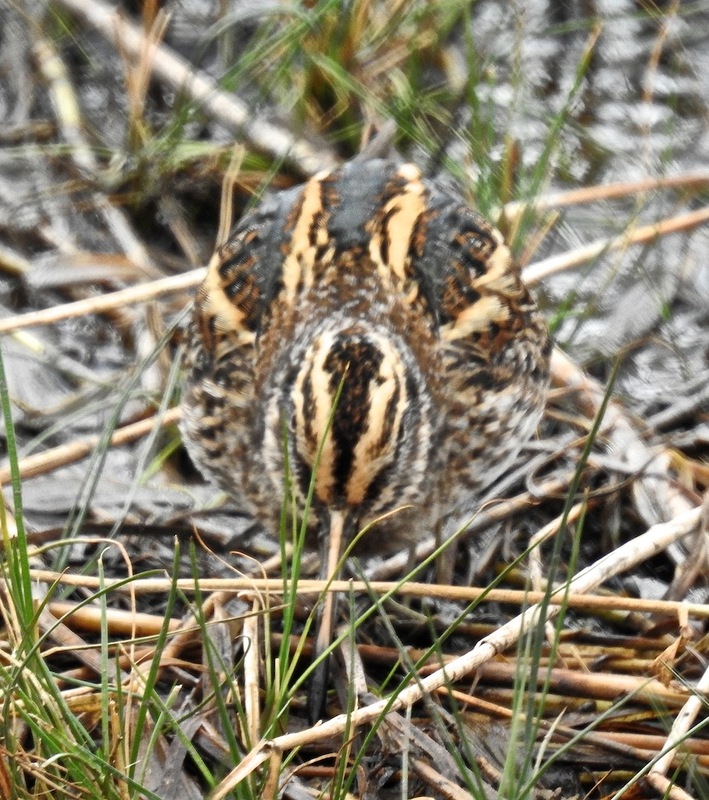 Good call as ever from Mr Roadhouse – it was a beautifully marked bird, pumping its tail away in the failing light and creeping around in slo-mo like a crrr-azy crake. What a cracker, cheers Andy!!! Lots of “bang” today, with some wonderful birds and great laughs, even without the hoped for MEGA “boom”. 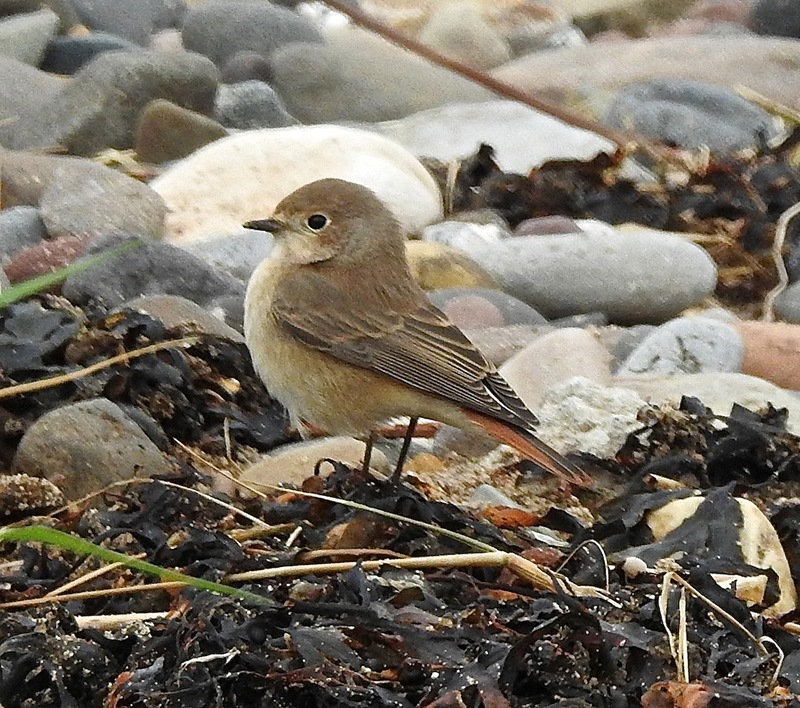 Undoubtedly the busiest of our day-trips to Spurn so far this autumn, and the season may only get better. Thanks for the driving shift Neill. 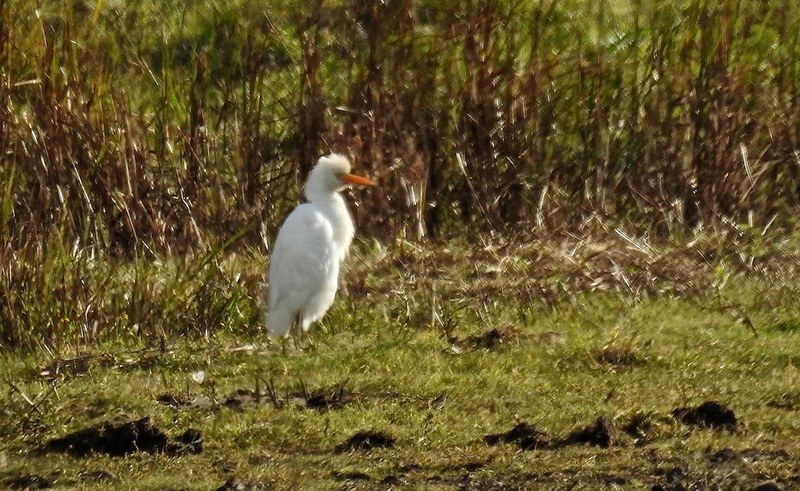 Getting seriously full of egret now – after the gut-busting nine Great White Egret fly-by on Wednesday morning, the Persil-white score was further swelled by two new Cattle Egrets joining the long stayer at Marshside this morning. Popped in as I was passing for the Cattle Egret hat-trick and to say “hi” to Terry Meehan (howdy Terry). 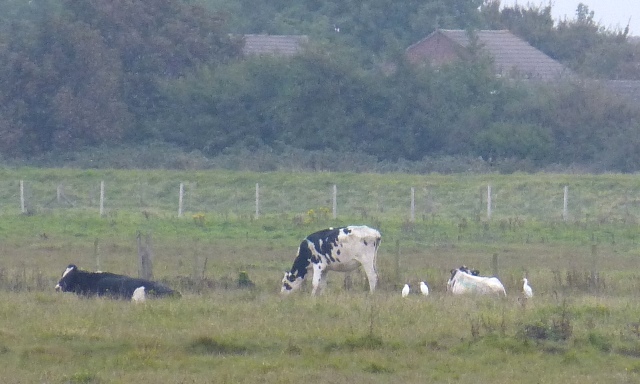 The Cattle Egrets were at the back from Sandgrounders, mooching around the coos as they should. 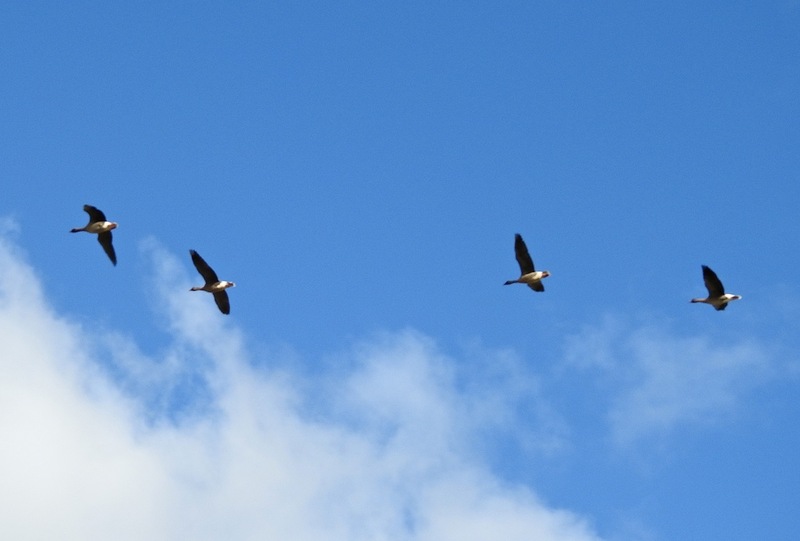 Angels on broomsticks on Wednesday, three white chickens today. 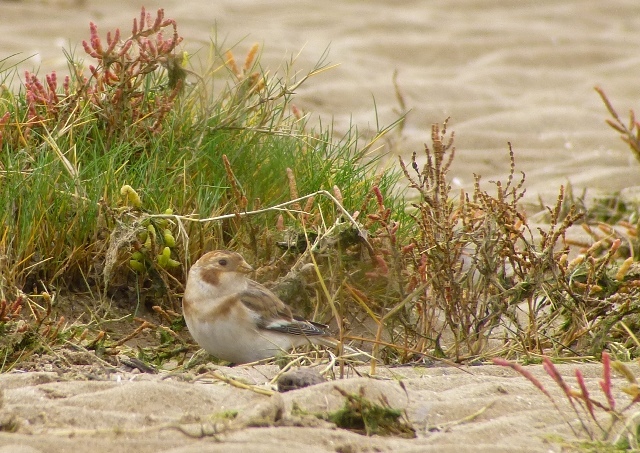 Elsewhere quiet today, although a Chiffchaff was in full song at Queen’s Jubilee Nature Trail at Southport, before the sea frets flopped in this morning, and Redwings, Mipits, Grey Wag, Skylark and smaller numbers of Swallows were on the move south over the dunes at Ainsdale early doors. 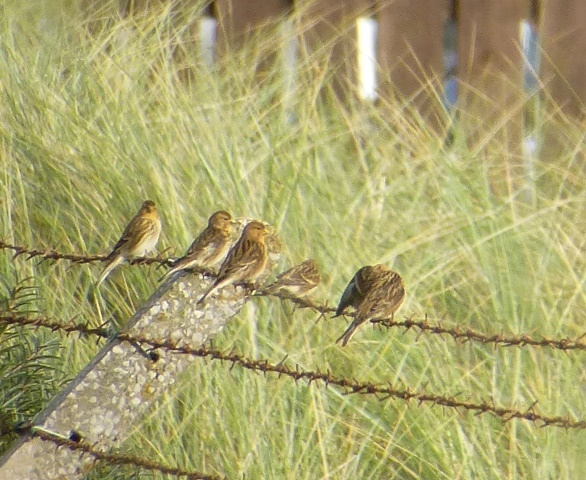 Still a few Sarnie Terns at Ainsdale, hordes of scoters and a few Gannets offshore. 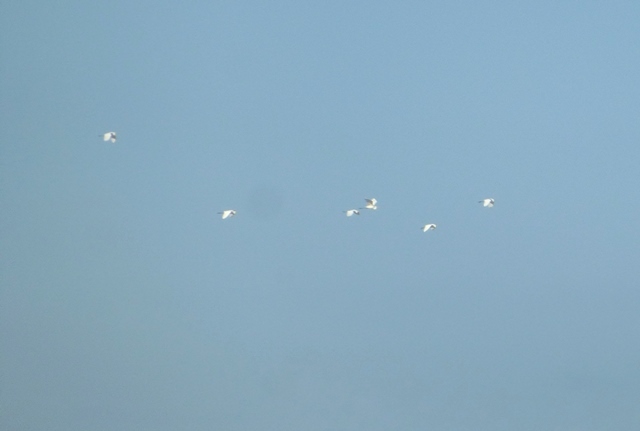 Super-sharpened, blown-up, cropped and Lord knows what else…all nine Great White Egrets flapping past Ainsdale on Wednesday morning. But you’ll need to squint hard, even if you click on the pic to see it bigger. 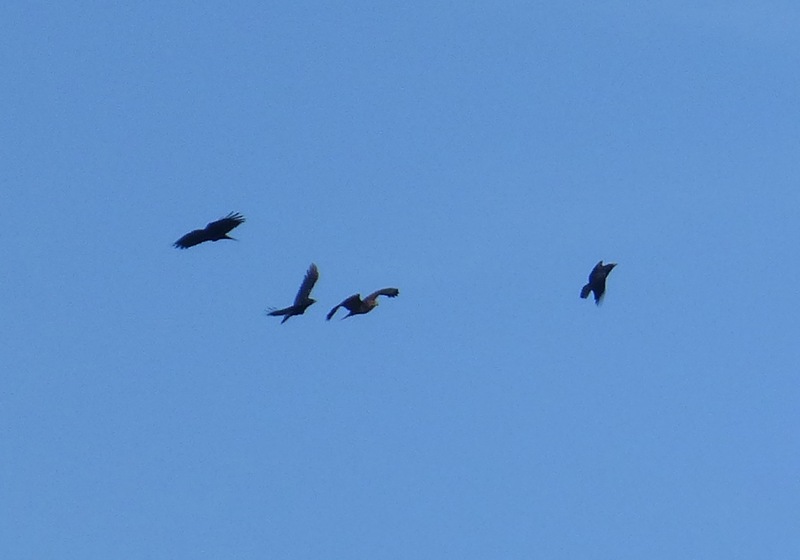 Six and (in the top centre) a tight group of three. 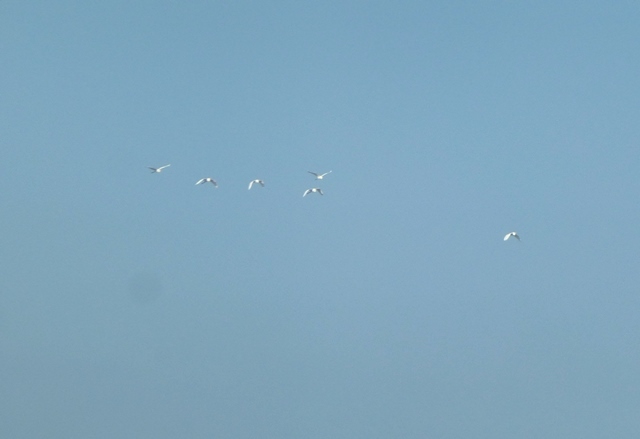 A loose group, they came by just after 10am, and frustratingly I never managed to get a decent shot of them all in frame at the same time (although I have got one image I’m going to monkey with that shows “8+”), but as white blobs on a blue background go, they’re quite fetching. 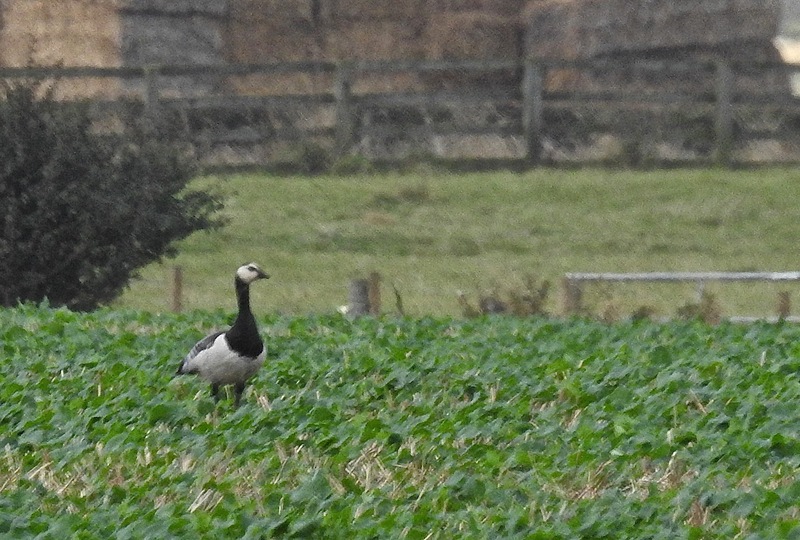 Ashley Baines had them come off the Ribble to the north about 30 minutes later. 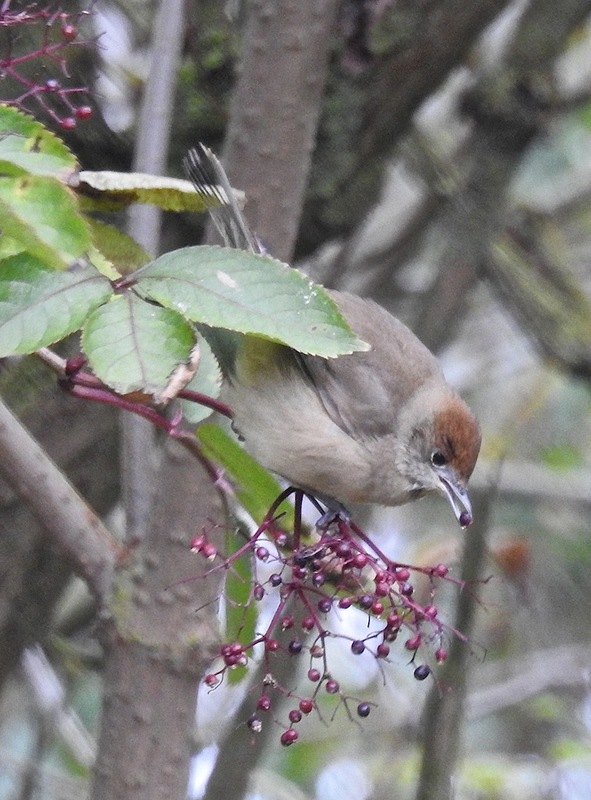 Can’t remember seeing so many GWEs at once in the UK before (and that includes Ham Wall in Somerset).